The rest of July then becomes somewhat epic with no work getting done in Caine Hill due to lack of personnel, a couple of very promising extensions being made above the downstream end of Wigmore Swallet and my diagnosis with incurable lung cancer. The latter, at this time, is not painful so life goes on as best as possible. Dave "Tusker" Morrison suggested on 4/8/08 to start a new "Hymac" dig and instantly I suggested trying to get a new entrance to Wigmore. Dave, having just lost his wife we are both in low spirits and this is the obvious cure! I'm on Death's bloody door and organising a major dig! Unbelievable! 21/8/08 Wigmore Farm, Red Quar. Today was the commencement of the great excavator dig in search of an entrance leading directly to the Wigmore Ten streamway. The weather was much improved and the sun actually shone at times! Dave "Tuska" Morrison and Mark Crook - driver of the Hitachi Zaxis 130 LCN excavator (smart, orange, new and powerful) turned up early to start stripping topsoil from the wide, shallow depression that is the furthest from the farm track. It is around 3-5 metres deep and a trickle of water sinks into the slightly smaller one adjoining it to the NW. ¶ Soon after ten a.m. Jane, Henry D, me, Tony and Alice Audsley and Tangent arrived in two Land Rovers and Jim Young walked in later. Nigel Perkins, the tenant farmer, also came over by Land Rover for a look. The dry top layer of maroon soil had a few lumps of sandy rock in. Mark then sank a deep pit at the NW end of the depression through fragile and waterworn rock layers to hit a more solid, vertical, apparently waterworn face beneath. Below this again was a horizontal rock layer and seemingly another drop near an area of red, sticky clay. Tuska was very optimistic after finding this solid area. ¶ At lunch time, Mark went off to get the concrete pipes while four of us went to the Hunters' with Tangent and I dumping a load of bags (about fifty) from Caine Hill Shaft on the way back!. Penny Wiseman had been to look at the dig in the meantime and was impressed with its tidiness. Mark then returned with Dave Speed and 10metres of concrete pipes from Mells and Clive North also showed up for a look. Mark then continued digging while Tony plotted the three depressions and field boundaries using GPS. Next arrivals were William Waldegrave and his wife Caroline, who were very interested and happy with the work so far. After another vertical cliff was found and the depth of the hole became a bit excessive everyone knocked off at 6pm. A superb day's entertainment! 22/8/08 Mark, Tuska, and Jim were on site with Tony A. when Jane and I arrived at mid-day. The depression rims were noted on the map to be at 265 metres O.D. and the field is on the western slopes of Eaker Hill. On the latest Geology map, the dig is shown, just across the border from the Mercia Mudstone Group and in the Dolomitic Conglomerate. M.M.G. is composed of "red mudstones, siltstones and sandstones with occasional gypsum and celestite deposits". D.C.G. is "a coarse-grained, poorly sorted breccia comprising angular fragments of limestone and sandstone, locally cemented by silica and/or iron. This unit is part of the Mercia Mudstone Group and occurs on the flanks of the Mendips. It grades laterally into the Mercia Mudstone". ¶ Everyone packed in for lunch at 1.30 and then Mac, R.A. and I went off to Bristol Airport and climbed into MAc's 4-seater for a superb flight via Cheddar and Priddy and across Stock Hill to the dig where we circled a few times while R.A. took photos of the bloody impressive hole, the active excavator and the group of tiny spectators below. The Hunters', Wells and Welsh's Green area also got a fly-past as did Mac's farm before we flew back to Bristol after another cracking day's entertainment. 22/8/08 Continued. Another visitor in the afternoon was Rachel Clarke. Duncan and John had dived through to Wigmore Ten and cleared the debris from the last "snapper". They then pushed down through voids in the boulder choke to a point estimated at some 3 metres away from the noise of the main stream ahead. Further work is planned next weekend. They didn't hear any digging noises, having not visited Young Blood's Inlet but did note that the previously clear inlet stream was now black and stinking of cowsh - possibly due to recent movement of cattle at the farm. This needs checking out to locate the sink. 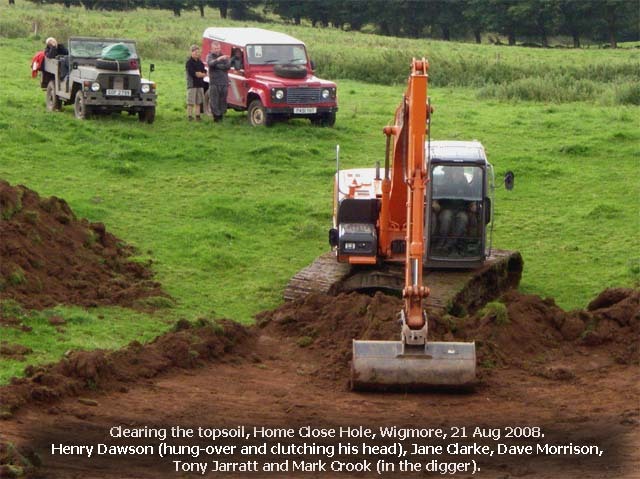 23/8/08 Wigmore Farm Area Mark Crook, Jane Clarke, Tony and Alice Audsley, Jim Young, Nigel and Mrs [Bridget] Perkins, Tim Large and Glenys Grass were all on site during the morning. Mark cleared and tidied the 10m deep rock walled "pot" and Nigel and team unloaded the pipes. Tony hectically took various mud samples from the spoil heaps. ¶ In the afternoon, Mac, R.A., Rich Witcombe and Mike Hearn went for a look and photosession. 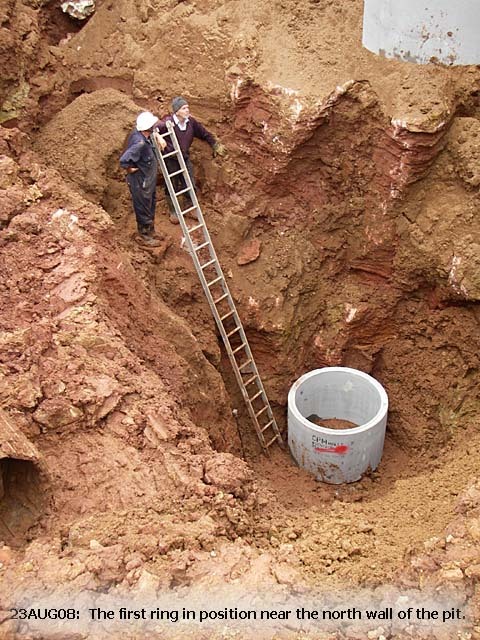 Dave Speed organized the insertion of the first of the pipes and four were emplaced on an unfortunately poor clay foundation before the day's end. Several others turned up to watch progress and I visited after work. A small inlet had been noted coming in from the northwest but was not deemed of interest. ¶ Well, the initial phase is over and future work will be difficult, but further excavation was out of the question so it's the best we can get. A bloody superb job altogether. Back on shift tomorrow. William and Caroline Waldegrave also re-appeared today to follow the progress of what seems to become known as Home Close Hole after the field name. 24/8/08 (Tuska, Michael Gibbons, Mark, Jim, Tony A, Dave Speed, Jane, Tangent, Darrell Insterell, Pete and Alison Moody, William - Lord Waldegrave of North Hill - and the Lady Caroline, the dog Monty, John Maneely and others). 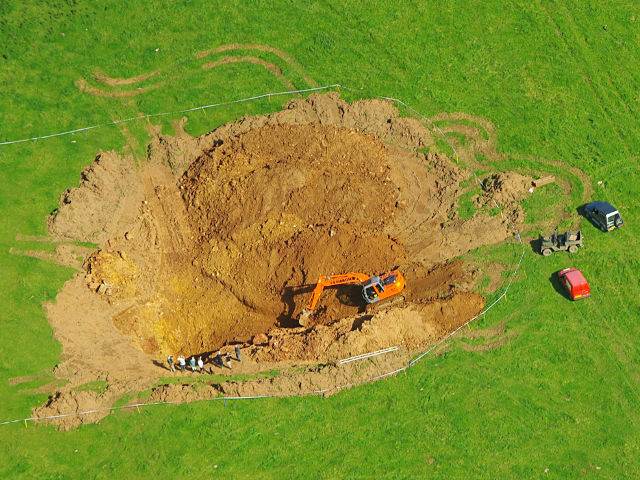 Early clearing work this morning revealed much of the south wall of the "circular" rock shaft or rift - thank God! It's encouraging to know that the pipes are inside a solid rock boundary and not in an open-sided alcove with a gully running off towards Attborough Swallet! A vital addition to the plant today was a bright yellow JCB 434S AGRI earthmover driven expertly by Michael Gibbons, the boss's son. Mark after a heavy night was back early on the Hitachi. ¶ Eventually, the tenth ring was added to the entrance and most of the backfilling was completed just before 7 p.m. Despite a heavy overnight downpour,s conditions weren't too bad and all went smoothly. Tuska and the team were all rightfully well pleased with the outcome. Indeed, so was I. 25/8/08 (Dave Speed and Father [Ed Speed], Mark, Michael, Jim, Tony A., Duncan Price, Nick Harding, Nick Richards). 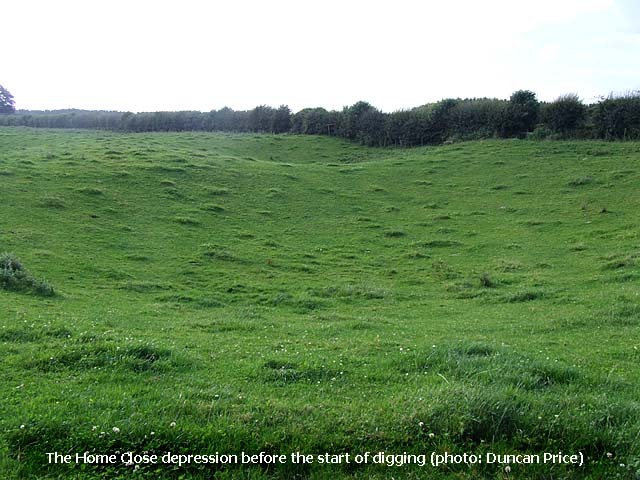 The depression was tidied up and the topsoil graded. Four large boulders were parked around the concrete pipe entrance for future use as picnic seats or tripod holders. The shaft rim protrudes some 0.2 m and I think that another section will be added in the future. All the plant was removed to leave a superbly tidy site. ¶ Here endeth stage one of the "Dry to Wigmore Ten" project. The next phase will be nowhere near as easy, but should be technically fascinating for those destined to be involved. Tony A. already has some good shoring ideas in hand. (On 21/8/08 Tangent and I took one L/Rover load - about 50 bags - to the dump. The 24th saw Jane filling thirteen loads at the end, Tangent, Darrell Insterell and I taking a sixty bag Land Rover load to the dump and Henry D, Andy McDonald and Barry Lawton digging and shifting at the end. Next day Tangent filled ten bags from the RH Updip Pastel Passage and another ten from the end. rough diamonds in any other walk of life.